A renowned tree which appears to have metal growing out of it has been awarded protected status. The 'Bicycle Tree' is close to the site of a former blacksmith's shop in Brig O'Turk in the Trossachs. It is known for its unusual features, particularly a bicycle handlebars and part of a frame which are on the trunk. Loch Lomond and the Trossachs National Park confirmed it has issued a provisional tree preservation order after a campaign. Along with the bike, it is thought a ship's anchor and chain and parts of a horse's bridle may also have been swallowed up by the sycamore's expanding trunk. The tree is in Dorothy's Field, Brig o'Turk, about half a mile north of the village on the Glen Finglas road and about seven miles west of Callander. The tree is thought to have self-seeded, sometime in the late 1800s, and gathered the metal as it was next to a blacksmith's scrapheap. The bicycle is believed to have belonged to a villager, conscripted during World War One, who left it hanging on a branch. A spokeswoman from Loch Lomond and the Trossachs National Park said: "The mature sycamore (Acer pseudoplatanus) has significant cultural and historic heritage which is recognised locally, regionally and nationally. 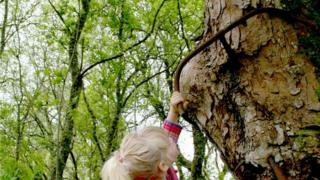 "The tree has been recorded on a number of veteran tree surveys such as Loch Lomond and the Trossachs Countryside Trust 2013 and Woodland Trust 'Ancient Tree Hunt' 2009." A campaign to protect the tree was launched in 2007 by local author John Barrington, who said the tree was "one of the great wonders" and "a freak of nature". He said: "The seedling grew up through this pile of scrap metal, on which the local blacksmith had thrown all kinds of things. "As it grew it swallowed up and took with it hundreds of bits and pieces of metal."